Fdit is a selfless and careful houseware craftsman, he devotes himself to provide the top-notch gardening watering cans to the common folk. We take each order seriously while our customers choose our can, because it is about your garden artwork. This is not a joke. we recognize you love your garden greatly. We fully understand it. Green and oxygen are really expensive. If it is so, this little 300/500 ml pot will be a wonderful choice for not so large jobs. The spout can easily poke between foliage to water small houseplants and very controllable. This spout puts the water exactly where you want it to go, it doesn't spill/splash everywhere. With this modern design, it can be kept at the ledge of your bathtub/desktop near your plants. Many of my friends spent 30 USD on cheaply plastic cans. It is difficult to figure out why they made this choice. Now, with hand polished stainless steel finished, it can prevent from corrosion and tarnishing on the surface. Different from most melting plastic on other offerings in the market, this long spout stainless can will help you, spill/leak/drip/splash will never appear on your bathtub/garden/desktop/balcony. Total length: 300ml(18.5cm / 7.28in); 500ml(22cm / 8.66in ). Diameter: 300ml(7.5cm / 2.95in); 500ml(9cm / 3.54in). 【Stylish design with hand polished steel finish】Nice brushed steel finish that blends in better than all these plastic cans, this watering can is designed brushed finish, hand polished stainless steel finish is build to resist daily scratches, corrosion and tarnishing. 【Never splits water】it helps to avoid spilling water on the leaves. It delivers the water precisely where you aim it with no spills, can reach in small places without spilling on your table. 【Efficient and convenient while refilling】Semi-open top design makes it convenient to refill water and the ergonomic handle is comfortable to hold. Long spout & light weight helps it easy to reach under low-hanging leaves. 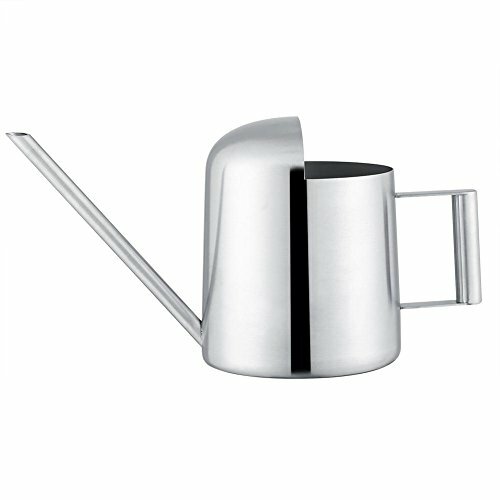 【Great decoration】Hand polished stainless steel finish, this is a modern stainless steel watering can, to be a perfect addition to your modern decor while being useful as well! 【A perfect watering can for indoor plants】It doesn't hold a ton of water, but you probably don't want to be lugging a huge watering can. It is light weight and even easy for your little daughter to maneuver through the lower leaves of an ivy. Nice size for in small house plant watering.